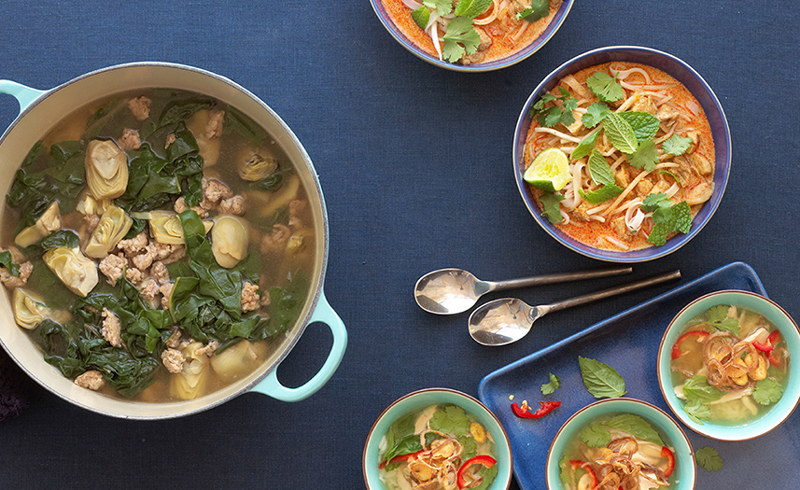 If your January resolutions are starting to wane, try this super-easy soup cleanse. Every day this week, start one or two meals a day with a cup of broth-based soup, which will curb cravings, pack in produce, and reduce overall calorie intake. The goal is to eat 5 to 7 each week. First step: the broth. You can either purchase a low-sodium variety from the store, or if your inner chef is feeling up to it, make your own from scratch. Broth will stay good in the refrigerator for up to five days, and it also freezes well, so you can make a large batch to have on hand for quick weeknight soup. Once your chicken, beef, or veggie broth is done, you have your base for one of these delicious recipes — perfect as a low-calorie starter to your meal. Clocking in at just 46 calories, this tasty soup from Inspiralized makes a great start to any meal. Spiralizing the carrots is a fun way to add fiber and satisfying texture. If you can't find carrots large enough to spiralize, feel free to swap in other veggies like zucchini or turnips. A combination of potatoes, spinach, and fresh rosemary results in a tasty soup with a gorgeous green hue and a creamy texture. Skip the croutons to shave off even more calories and keep things light. Never tried turmeric? This delicious recipe from SkinnyTaste is a great excuse to add the powerful spice to your repertoire. In this recipe, it's sprinkled, along with cumin, over the cauliflower before roasting to create a delicately earthy, nutty flavor. Save the remaining cauliflower as a garnish or a fiber-filled snack! Start your meal with a delicious soup made with gorgeous beefsteak tomatoes, plus tomato juice and tomato paste. Tomatoes really pack in the nutrients: Heart-healthy antioxidants like vitamins C and E, beta-carotene, lycopene, and potassium are all on the menu. 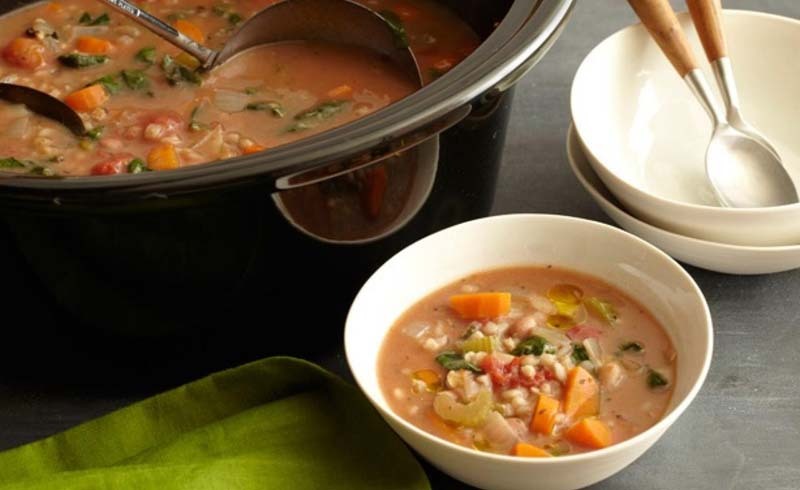 With 6 grams of fiber and 10 grams of protein, this hearty soup from SkinnyMs. will fill you up and keep you from overindulging on the rest of your meal. Plus, it’s a cinch to make: Simply throw all the ingredients into your slow cooker in the morning, and you’ll come home to a healthy soup you can eat all week. To keep your salt intake in check, be sure to use low-sodium broth and season lightly. Tell us: What are your favorite soups?